Goretti Campbell has planned an away trip to beautiful West Cork which is taking place next weekend, May 18th to 20th. The base is the village of Glengarriff and there will be a choice of A, B or C walks on the Saturday and a B or C walk on the Sunday. The walks will be in association with the Skibbereen Walking Group who came to walk with us in the Galtees last September. Goretti wishes all those travelling a most enjoyable weekend. Following the Beara Way SW from Reen Bridge then ridge to traverse south face of Hungry Hill. Ascent of south face via gullies and terraces to south cairn (667m). North to col then descending NW and NE dropping to col before ascent of Derryclancy (554m) and on to the top of the Healy Pass. Duration approx. 6 hrs, 12.5km and 880m ascent. Following the Beara Way from Reen Bridge then tracking across beside the twin lakes Coomerkane and Coomadayallig. Lunch break (can return from here) then converging with the Grade A route/group at Coombane and on to the top of the Healy Pass. Duration approx. 6 hours, 10km, ascent 580m. Illnacullin Garnish Island. Historic island garden tour. 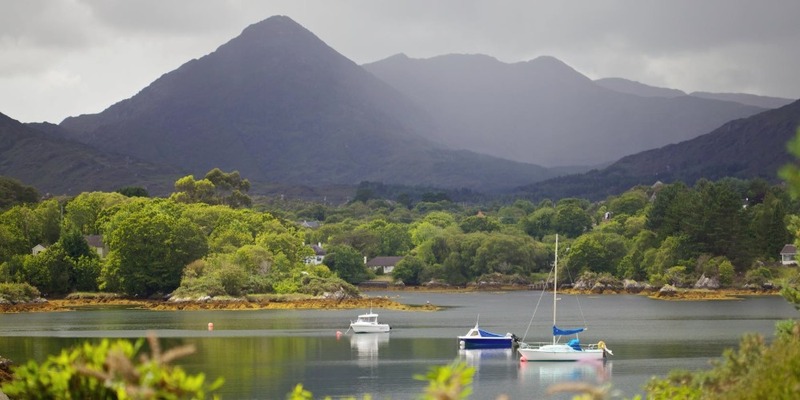 The island of Ilnacullin extends to 37 acres and is renowned for its gardens which flourish in the mild humid micro-climate of Glengarriff harbour. Structures include a clock tower, a Grecian temple, a Martello Tower, and an Italian casita. Boat trip and easy walking with coffee shop. Duration approx. 4 hours. Entry fee €5 (€4 concession). Separate charge for boat trip about €10 but will advise if we are able to get group price. Barley Lake and Coomerkane. Grade C Intermediate Walk. Commencing from the SW side of the Glengarriff Woods going up alongside Barley Lake and then descending back into the Coomerkane Valley and up to the twin loughs Dereenaderoda and Eekenohoolikeaghaun, returning to the start. In May the valley is usually spectacular with flowering Rhododendron. Approx. 8 kms, duration approx. 3.5 hours, ascent approx. 450m. Commencing at the main car park we take the Esknamucky Walk alongside waterfalls to viewing points then follow the perimeter road around the woods to Lady Bantry’s Lookout. This is a gentle walk through ancient oak and holly woodlands with magnificent views over mountain and valley. Duration approx. 3.5 hours. There are several shorter route options available. Other places of interest for non-walkers. The Ewe Experience. A series of linked woodland gardens with thematic sculptures and curiosities. Very entertaining and thought provoking – for all the family and all age groups.